Look at those smiles. Just look at them. 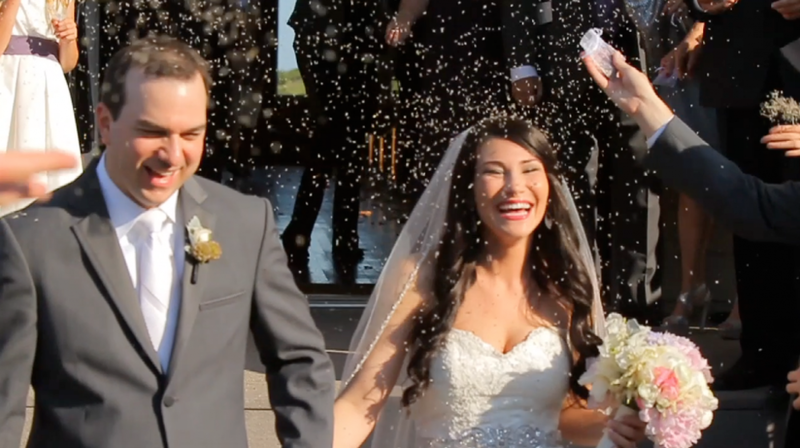 This image is a still shot from the moment when Allison and Ryan stepped out of the rustic hall where they were married. They were met by the pealing of bells, the sweet scent of lavender as it was being tossed, and the cheers of their family members. To me, this says "sheer bliss." See it for yourself. In our previous post, we featured their wedding video preview, so here is their wedding film, from the sweet beginning to the rock'n'roll end. Allison and Ryan were married in early June 2012 at the gorgeous and sprawling Ranch resort called Rough Creek Lodge, just outside of Glenrose, Texas. Allison and Ryan are Florida Natives, but they chose this rustic setting for their wedding partially because of all the fun recreational and relaxing activity options it provides for families, couples, and children. Allison also mentioned to me that day that she had attended a friend's wedding there previously, and from that point on she and Ryan had been charmed by the complete sense of peace surrounding the setting. We could tell that their family had an amazing time, and the way they sweetly doted on Allison and Ryan. One of the most heartfelt moments of the evening culminated in Allison's parents' presentation and speech during the reception where they shared the importance of the history of their family and how proud they are of their children who are all very intelligent, successful, and kind individuals. We can't get enough of this moment from Allison's wedding where her mother and sister helped her finalize her bridal detals. Their love and outward displays of affection for Allison were simply precious. Allison and Ryan, Thank you for letting us be a part of capturing these kind and tender moments in your family's life. We wish you all the best that life can offer, and we already know you have the drive and passion to find it. We paused to briefly capture some sunset shots before entering the reception. The light was gorgeous. Kym Skiles from F8 studios in DFW/Addison, TX was there to photograph the day. We can't say enough great things about Kym's work or her amazing sense of humor. We love working alongside her. The lodge has a great hall with a grand fireplace just off-center. This shot shows only 2/3 of the room. This scene would later hold the moment where Allison's grandmother catches the bouquet and gets a kiss on the cheek from her own grandson, who caught the garter. It was pretty hilarious. The talented people at Blue Lotus Floral did a stunning job with the table centerpieces. 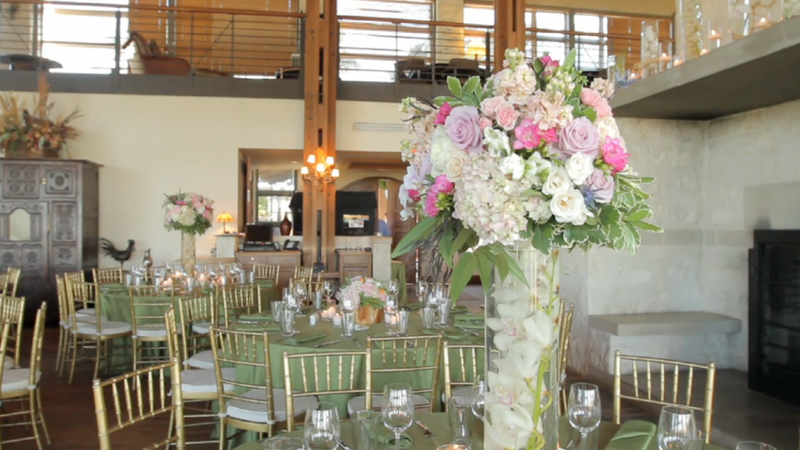 As you can see, they put together a mixture of high and low arrangements that complemented Allison's color choices very well, incorporating the lavender of the bridesmaid's dresses with pink accents. This candy table was taken up a notch from normal candy tables, filled with a mixture of homemade versions of store-famous brands and delicate artisan-created dessert snacks. The groom's cake was a sports themed cake with a baseball cap on top. While the cap design and construction is expertly put together by the decorators at Frosted Art, my favorite detail is the baseline with bases running around the top part of the first tier of this square, or, rather diamond-shaped cake. Allison & Ryan also had a cute idea for how to make their photobooth photos a part of their party favors. At each table was an envelope that read "Thank you for making our day picture perfect." The good folks at Snapzsnapz made sure that Allison & Ryan got a keepsake copy of each print out, but they sent the guests home with their own copies in these cute envelopes. The Enchanting wedding ring set. Amazing floral bouquets from Blue Lotus Floral. Thanks for reading! If you want to see more of what we've been doing, please join us on facebook-- we would love to hear from you. As Jones always says, "don't be a stranger."